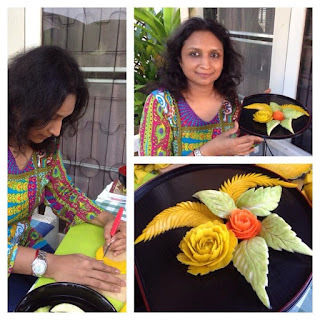 VEGETABLE AND FRUIT CARVING TRAINING AND PROFESSIONAL SERVICES NOW AVAILABLE FROM PARUL SHAH IN MUMBAI. Gives me great pride and happiness to promote my dear friend Parul Shah's Vegetable and Fruit Carving Blog on my Page. Parul Shah brings over 15 years of experience in the Thai Culinary Art of Fruit, Vegetable Carving and Garnishing to her Work. She offers Training Courses for Enthusiastic Carving Artists wanting to learn this art besides rendering her Professional Skilled services to Caterers, Event Management Companies, Corporate Companies, Hotels, and Individuals for Occasions such as Marriages, Birthdays, Wedding Anniversaries, Parties, and Corporate Functions where her art will amaze the visitors and audience! Moreover happy to inform that I have done the complete design, setup and promotion of this Blog as well as all her Social Media Integration as I will be handling her Social Media Integration and promotion for her. Wishing her all the Best in her Endeavors and I am sure students interested in learning this fantastic Thai Art of Vegetable and Fruit Carving and Garnish will contact her in this regard. Do make the best of this opportunity and contact for further details. Wishing Parul the very Best in her endeavors! God Bless! Continuing on my series of Blog Trailers for my respective Blogs, I am happy to present my most recently published Trailer Video on YouTube - VEGETABLE AND FRUIT CARVING. This Blog gives is an overview of the fantastic art of Thai Fruit and Vegetables Carving. Learn about this wonderful Art, learn how to use vegetable and fruit carving tools, used for carving vegetable and fruits. See vegetable carving, fruit carving pictures, videos, books, online demo, classes, etc. A feast for your eyes as well as your palate! The purpose of fruit and vegetable carving is to make food more attractive, more appetizing, and also easier to eat. The accomplished homemaker welcomes her guests with fruit carefully pared, seeded, and perhaps cut into bite-size slices depending on the type of fruit. Vegetables are first delicately carved, and finally arranged attractively to decorate the dish which they are part of. Needless to say, guests are greatly pleased to be honored with such a gracious welcome, displaying as it does the good feelings and willing hospitality of the maker. Decorating fresh, well-formed and colorful fruits and vegetables through artistic carving is by no means difficult. All it takes is concentration and a lot of practice. This Blog will deal with all you wanted to know about this wonderful art of Vegetable and Fruit Carving. WATCH THE VEGETABLE AND FRUIT CARVING BLOG TRAILER HERE. Your views, comments, suggestions along with your motivation, Best Wishes and Blessing will be highly appreciated!